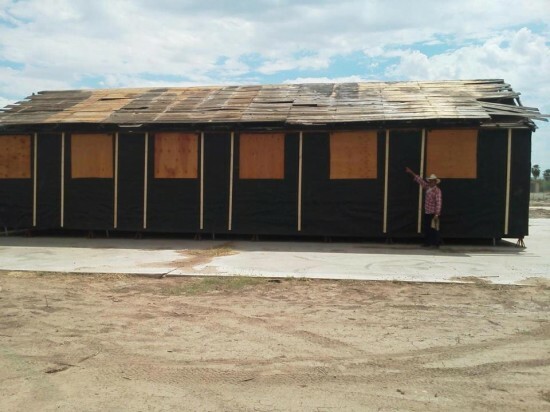 The barrack restoration project at Poston, Ariz., funded by a FY 2010 Japanese American Confinement Sites grant project. DENVER – The National Park Service is now accepting applications for grants to preserve and interpret the sites where more than 120,000 Japanese Americans were detained during World War II. This year’s deadline for applications is Thursday, Nov. 1. This marks the fifth year in the Japanese American Confinement Sites Grant Program, which Congress established in 2006. Over the past four years, Congress has assigned nearly $9.7 million in grants to 83 projects in or involving 17 states and the District of Columbia. The president’s budget plan for fiscal year 2013 calls for $3 million more for the program. Japanese American Confinement Sites grants are awarded to eligible groups and bodies – non-profit organizations, educational institutions and state, local and tribal governments – for work to preserve confinement sites and their histories. The goal is to preserve and explain the places where Japanese American men, women and children – most of them U.S. citizens – were relocated and held after Japan attacked Pearl Harbor in 1941. Congress has authorized that up to $38 million in grants can be awarded over the life of the program, with funds appropriated annually. Grant money can be used to identify, research, evaluate, interpret, protect, restore, repair and acquire historic internment sites so that present and future generations can learn of and gain inspiration from the sites and those who were held in them. For fiscal year 2012, the National Park Service distributed 17 grants totaling nearly $2.9 million. Grant-winning projects over the past four years have been undertaken in Arizona, Arkansas, California, Colorado, Hawaii, Idaho, Illinois, Massachusetts, Minnesota, Montana, New Mexico, North Dakota, Oregon, Texas, Utah, Washington, Washington, D.C., and Wyoming. Although many projects are tied to single, specific locations, some also range across multiple sites and are conducted from other places and states. The program encourages applicants to raise project funds from other sources to meet a one-for-two match with the grant money, which is awarded in a competitive process. Successful grantees must match $1 in non-federal funds or in-kind contributions to every $2 they receive in federal money. Matching funds can be raised and spent during the grant period and do not have to be “in the bank” at the time a group applies for a grant. Applicants also can receive up to two grant awards a year. More than 50 historical locations are eligible for grant-funded work. They include the 10 War Relocation Authority (WRA) camps that were set up in 1942 in seven states: Granada (Amache), Colo.; Gila River and Poston, Ariz.; Heart Mountain, Wyo. ; Jerome and Rohwer, Ark. ; Manzanar and Tule Lake, Calif.; Minidoka, Idaho; and Topaz, Utah. Also eligible are more than 40 other locations in 16 states, including civilian and military-run assembly, relocation and isolation centers. Of the 10 WRA sites, three are now units of the National Park Service (Manzanar National Historic Site, Minidoka Internment National Monument, and Tule Lake National Monument) and four are National Historic Landmarks (the Rohwer cemetery, and the Granada [Amache], Topaz and Heart Mountain camps). Grants can be for a variety of uses, including design and construction of interpretive centers, trails, wayside exhibits and other facilities; oral histories and site-history research; school curricula on internment history; and purchase of non-federal land at five of the sites (Jerome, Rohwer, Honouliuli in Hawaii, Topaz, and Heart Mountain). More information, including 2013 application materials and lists of the program’s most recent awards for 2012, is available on the grant program website: www.nps.gov/history/hps/hpg/JACS/index.html.